The water crisis in Maharashtra now affects 90 lakh farmers, equal to almost the entire population of Sweden. 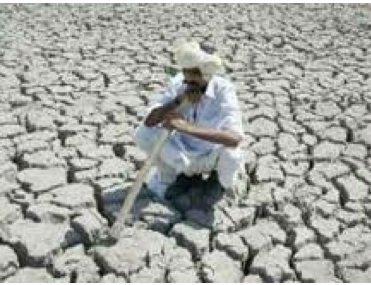 MUMBAI: Nearly 90 lakh farmers in Maharashtra have been impacted by the drought that has devastated the kharif crop, official data shows. The figure is almost on a par with the population of Sweden. Maharashtra is already known for its farm crisis and reports the highest number of farmer's suicides in the country. The drought — brought on by a delayed and inadequate monsoon — is set to deepen the distress for its cultivators. Data with the agriculture department shows that two-thirds of the state's 1.37 crore farmers have been affected by the drought which has impacted mainly the Marathwada and Vidarbha regions. These areas have historically been the most deprived in the state. Two weeks ago, the state government officially declared that 60% of its villages were facing a "drought-like condition". This means that they reported a crop yield which was less than 50% of the standard yield in the area. In absolute figures, 23,811 of the state's 39,453 villages come in this category. This will result in a drastic fall in the state's agricultural output for the year, officials said. "It is a very difficult situation. Farmers in the state are facing severe agrarian distress," said state relief and rehabilitation secretary K H Govinda Raj. The state government has released relief worth Rs 2,000 crore so far, he added. The state had asked the Central government for aid worth Rs 4,800 crore but that's yet to come in. Vidarbha-based farmer activist Vijay Jawandia pointed out that this is the fourth drought in the state since 2008. "The impact on farmers is only getting worse. Earlier farmers used to suffer because of low yields but at least they got a decent price for their produce. Now they have poor yield and very low prices for their crop," he said. In his estimation, the cotton and soyabean crop in the state could see a dramatic drop in yield. "The total cotton production in Maharashtra could drop by 1.5 crore quintals this year. The soyabean yield was 4 quintals per acre. This year it could be just half of that," he said.